The holidays can be a stressful and busy time of the year, but that doesn’t mean your health habits need to be completely derailed. It may be difficult to do ALL that you want to do, or even keep up with the new changes that you have made to your eating and fitness program. Revisit your top priorities that can make the BIGGEST difference to your health, weight loss program, eating disorder recovery, or whatever goal you are working towards. Put your efforts where you will get the biggest return on your investment. This might mean intentionally choosing a healthy breakfast every day no matter what, or packing a bunch of energizing snacks for the office for the entire week ahead. Each morning, when you are in the shower, on the way to work, or after dropping off kids at school, think about the ONE thing you can commit to today when it comes to your health. Any amount of planning helps ensure the day nudges towards health instead of leaving it to chance. What is the ONE thing today that can help you move towards a healthier you? PS Remember you don’t need to be perfect and of course there is always room for soulful fun foods chosen for taste and enjoyment. 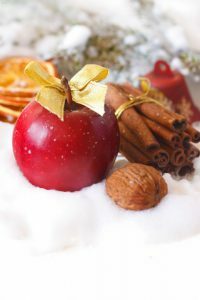 Intentionally choose when you are going to indulge in your favorite sweets and decadent holiday foods and make healthy choices around these.